Given the countless powerful relics the Pathfinder Society keeps in the vaults beneath the Grand Lodge, it should come as no surprise when there's the occasional magical outburst. However, the most recent incident involves a powerful talisman opening a portal the Hell, and the head curator Zarta Dralneen believes this event is no mere coincidence. Alongside a band of elite Pathfinders, she intends to travel through the portal to the infernal city Dis in order to close the gateway, in the process uncovering Cheliax's secret history, the follies of House Thrune, and what her role will be in the events to come. 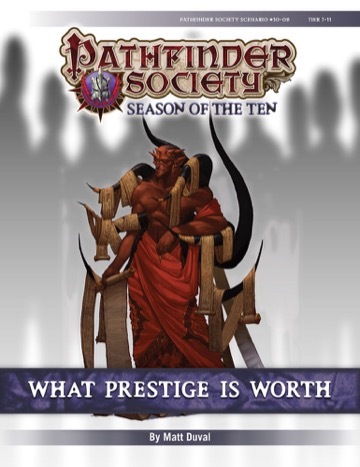 Contents in What Prestige is Worth also contribute directly to the ongoing storyline of the Dark Archive faction. Hellknight Lapè awaits his orders. So... are we going core or regular? I can go either way myself.